NOVEMBER 2018 THE SHOP 99 Five times a year, the entire staff goes to help Stelse at the vintage drag races. Leah says they take "a couple of holidays, too." Race cars and modified cars are Greg's favorites. "But I love them all," he says. "Right now, I'm going after what people like, so there will be resto-mods. I prefer a blower and carburetors, but I love Packards, too. So, for me, it's just anything to do with a car." As far as promoting the business, it's mainly word-of-mouth advertising so far. "I guess I'll just keep talking," Greg jokes. "I really believe that if people understand me, they'll get it. And that's how it's going to be promoted. I think that, with what I have going on around here, by slowing peoples' lives down when they walk into my place, that's what everybody will really like. Because everybody knows life is going by way too fast." Leah is doing some promoting herself in the kustom kulture end of the business. In addition to the vintage clothing shop, she had pin-up girl expert Cherry Dollface hold her pin-up and makeup classes at the shop. Leah also had the photographer Shannon Brooke—who used to be Jesse James' photographer—come to Greg's Speed Shop for a photo shoot. Working Class Publishing publishes Brooke's books, and the shop would like to hold a future book opening. So, where is this going to wind up? Greg doesn't know. "There are no limits," he believes. "We are really going to go where people want us to go," Leah adds. "We're riding the wave and we're going where it takes us. We have invested pretty much all our retirement into this, although we pretty much did it debt-free. We don't have huge monthly payments to worry about. We're busy and if it stays that way it makes life a little easier. If it doesn't work, I guess we'll have a cool place to live." 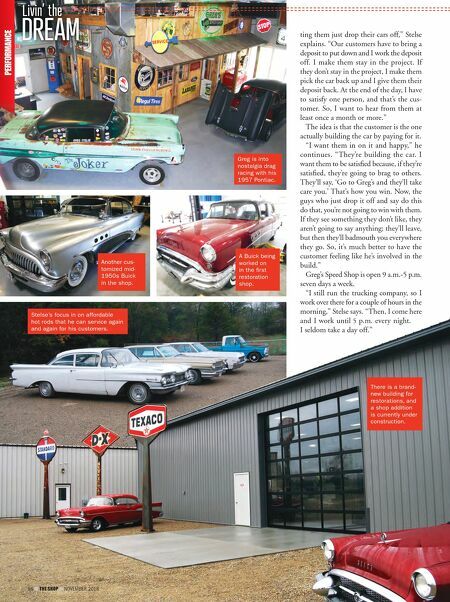 JOHN GUNNELL has been writing about classic cars since 1972. 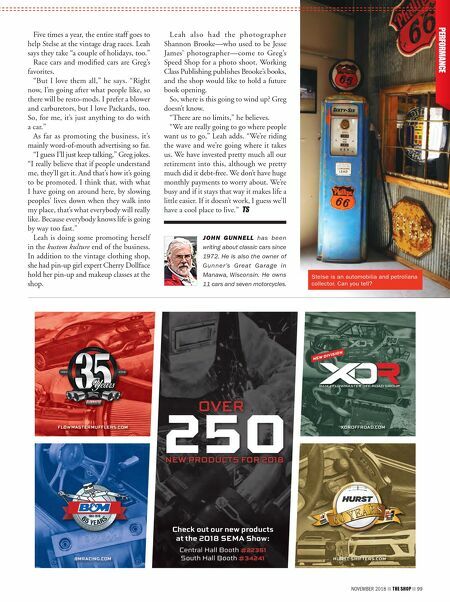 He is also the owner of Gunner's Great Garage in Manawa, Wisconsin. He owns 11 cars and seven motorcycles. Stelse is an automobilia and petroliana collector. Can you tell?